How long is the RHCE “good” for? – It seems like this is the million dollar question everyone wants answered –including myself. Some people say the RHCE is only good for a single major release of Red Hat Enterprise Linux (RHEL), others say its a year or two without providing anything substantial to back such claims. However, according to RedHat, the RHCE is valid for 2 full releases after the release on which the exam was taken. The validity period for all RHCEs and RHCTs is pegged to the release of the Enterprise product commercially available at the time certification was earned. RHCE and RHCT certifications are considered current until Red Hat retires exams of the release following the version on which your certification was earned. For example, certificates earned on Red Hat Enterprise Linux 3 will be current until August 31, 2007, the last date on which Red Hat Enterprise Linux 4 exams will be offered. Note that Red Hat Enterprise Linux 5 was released in March, months before the final retirement of the version 4 exams. To provide further clarification for earlier versions, Red Hat Enterprise Linux 4 will remain current until Red Hat Enterprise Linux 5 exams are retired, several months after the release of Red Hat Enterprise Linux 6. 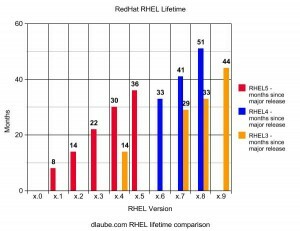 Now this raises another interesting question; What’s the life expectancy of a RHEL release? 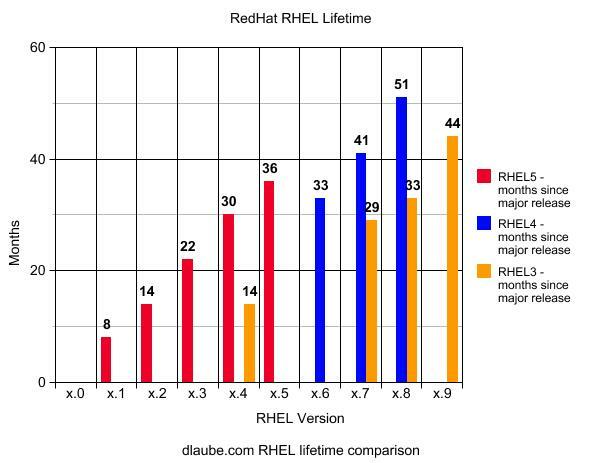 In my next blog post, I attempt to answer this question and provide an easy to read bar graph illustrating RedHat releases of RHEL3, RHEL4 and RHEL5. I also offer a time-line for each of the RHEL releases. When is it a good time to check to see if a hard drive is failing? Well, when your console is full of IO/seek errors, I’d say that is a pretty good time! Hah. According to research conducted by Google, a document entitled Failure Trends in a Large Disk Drive Population states that the manufacturer, particular model and vintage plays a role, but does not provide failure statistics on model and manufacturers. Most drives were run at 45C or less. From the SMART data, scan errors, reallocations, offline reallocations and probational counts had a significant correlation with failure probability, whereas seek errors, calibration retries and spin retries had little significance. Soooo…. you want to look at the Raw_Read_Error_Rate, Seek_Error_Rate and Reallocated_Sector_Ct information from smartctl. In regards to Reallocated_Sector_Ct, the normalized values (current=100, worst=100) indicate the drive is in perfect condition (higher is better, and looking at the overall report it appears that 100 is “best”). The threshold value (36) just indicates how low the normalized value would have to drop before the manufacturer would consider the drive to be in a “Pre-fail” condition. If you run “smartctl –all /dev/sdb | grep Error” again and notice that Raw_Read_Error_Rate and Seek_Error_Rate keep incrementing AND Reallocated_Sector_Ct is greater than 0, its pretty safe to say that you have a ticking time-bomb on your hands. You should consider replacing those drives as soon as possible.